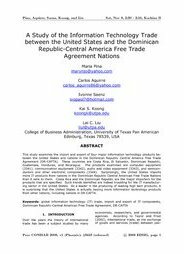 This study examines the import and export of four major information technology products between the United States and nations in the Dominican Republic Central America Free Trade Agreement (DR-CAFTA). These countries are Costa Rica, El Salvador, Dominican Republic, Guatemala, Honduras, and Nicaragua. The products examined are computer equipment (3341), communication equipment (3342), audio and video equipment (3343), and semiconductors and other electronic components (3344). Surprisingly, the United States imports more IT products from nations in the Dominican Republic Central American Free Trade Nations than it sells to them. Costa Rica and the Dominican Republic are the major importers for the products that are specified. Such trends identified are indeed troubling for the IT manufacturing sector in the United States. As a leader in the producing of leading high tech products, it is surprising that the United States is actually buying more information technology products from other nations, including nations in DR-CAFTA.